Army Corporal Aaron Jacinto served as a medic in the Army and Navy, deploying to Iraq in 2005 with the 2nd Marine Expeditionary Force and later to Afghanistan in 2011 with the Army. Halfway through his second deployment with the 2-27th Infantry, 25th Infantry Division, he experienced firsthand what it was like to be a patient. On Nov. 19, 2011, CPL Jacinto’s barracks was hit by a mortar attack in Kunar Province, Afghanistan. The attack resulted in the partial amputation of both feet, broken tibia, and internal injuries. Aaron describes his rehabilitation process as “long and painful,” having undergone about 20 surgeries in total. After being discharged to do rehab at the Center for the Intrepid, Aaron says he felt “lost and defeated” not being able to walk or run. However, he was determined to regain those abilities. Within three years, Aaron was able to not only walk and run, but skydive, SCUBA dive and surf with prosthetics for his feet. While Aaron has made progress in activities on land and water, he faced challenges in his previous home. He previously lived in a two-story building that was not ADA compliant. He spent most of his time in his wheelchair, since he could not stand for long and relied on his service dog, Bear, to help him get up the stairs. “My previous place didn’t feel like a home to me, due to the fact there was always something in my house preventing me from doing my daily tasks,” he says. Aaron is currently a full time college student. He would like to use his medical background to go into the nursing field or become a physician’s assistant. He also wants to volunteer with a nonprofit that trains service dogs. He says his HFOT home adapted to his injuries will make reaching these goals attainable. 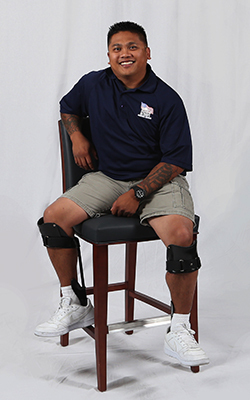 Originally from Aiea, Hawaii, Aaron choose to build his home in New Braunfels, Texas, because of the support he has there and to be close his prosthetics company. Aaron says he appreciates the donors and supporters at Homes For Our Troops who helped him receive this gift of a donated, specially adapted custom home. “The help you provided to me is most appreciated and won’t go to waste,” he says.